Just a general, misc post. 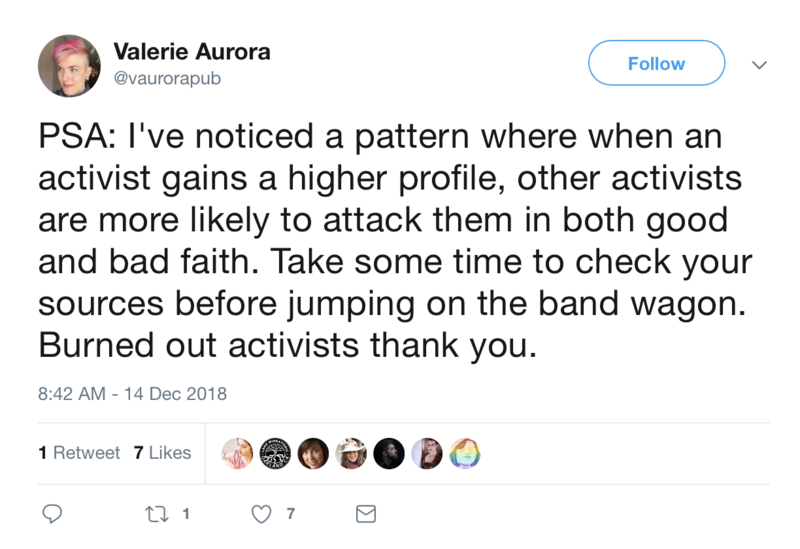 The purpose of this post is to publicly document what I understand regarding the problematic behavior of prominent tech feminist activist and diversity consultant Valerie Aurora. It is not meant to be an unimpeachable accounting but more of a connecting of the dots and a conversation starter. The content here, in its most recent iteration, started as a thread on Twitter. The announcement of a book on code of conduct enforcement written by Valerie and Mary Gardiner and distributed under Val’s consultancy, Frameshift. The banning of Valerie from Double Union, a feminist hacker space she co-founded, and her subsequent blog post on the matter (CW: transphobia, TERF). Folks including Sage Sharp, Jade Ahking, and Liz Fong-Jones have spoken eloquently about why Val’s position on Double Union’s membership policy change is trans-exclusionary, transphobic, and otherwise problematic. Were this Val’s only misstep, or one among a few over a handful of years, I would not be writing this post. Unfortunately, Val has demonstrated a pattern of problematic behavior towards several people over many years. Sage Sharp, on twitter here and here. Rachel Chalmers, on twitter here. Heidi Waterhouse, on twitter and in blog posts here and here. Denise Paolucci, via comment on Heidi’s post. Word of Val’s troubling behavior has been making the rounds via the whisper networks for some time. But whisper networks are dangerously exclusive. No one wants to interfere with the work of activists by needlessly airing our dirty laundry. However, I believe we’ve long since passed the tipping point where not talking openly about these concerns is doing more harm than good. Val’s most transgressive behavior has been directed not at me but at others I know, some well and some less so. It’s taken a while to put together a complete picture of Val’s conduct. When I first started to have misgivings about her behavior, I wasn’t sure who I could talk to about it. She seemed to have such a respected role in the community and I had prior experiences of being shunned for saying “negative” things about others, no matter the context. I thought, if my misgivings were just a matter of differences in personality or strategy, I didn’t want to poison the well, so to speak. But in the lead up to the Ada Initiative (TAI) hiring a new Executive Director and the subsequent aftermath of Val having that new ED fired and shutting down the organization, more folks started talking with one another. By this point in time I had already stopped directly supporting the work of the Ada Initiative, due in part to financial constraints but also due to significant misgivings about anything Val stewarded. After Val shut TAI down, I stopped recommending anything she worked on. If people asked I’d tell them I didn’t personally feel comfortable working with her because I did not trust her judgement or her approach. Since then, I’ve had the occasional Twitter rant about the poor governance and abuse of power demonstrated by Val’s shutdown of TAI. The most important details of Val’s misconduct are not mine to share because I did not experience them directly. I will leave it to others to share their stories if and when they feel it is appropriate to do so. Co-opting situations for her own benefit. Taking disproportionate credit for the work of others. An example here is the work many in the Geek Feminism Wiki community did on the Conference Anti-Harassment policy that, once the TAI was founded, Val rebranded as being of TAI origin. She even went so far as to go to folks who had adopted the Citizen Code of Conduct and told them that was actually the work of TAI and to change their attribution. (The Citizen CoC includes text from the original GF wiki text and is attributed as such.) The incident with Violet Blue could be considered an example of her co-opting a situation, among other things. Being unable to listen to and incorporate valid criticism and change her behavior accordingly. Deflecting and avoiding accountability. The situation with Double Union is a good example of this. So is everything having to do with the end of TAI (see Heidi‘s post, also linked to earlier, for a good summary; the Wikipedia page for TAI also has info and links). I have heard a number of stories of Val responding to criticisms of her behavior by blaming the other person. Want a recent example? Take a look at this not so vague tweet posted right after she started receiving flak for her post about Double Union. Abuse of power and position. Self-serving governance decisions. Again, see everything having to do with the shut down of TAI. Val orchestrated the release of the qualified executive director selected via a rigorous committee-led process. I know this was not a decision supported by the majority of those in governance positions at TAI by the exodus of folks from the board of directors and advisory board at the time. I don’t know the details of how she dispensed with those who did not support this power grab, but I know from the little others have shared that’s what it was. I believe we need leaders who can tolerate not being in control all of the time, who are team-players and consensus builders. Val has demonstrated the opposite of this time and time again. Disingenuous communication. Attempting to manipulate others. See the end of the Ada Initiative. The reasons given for the shutdown were not truthful. And still Val managed to orchestrate a good amount of positive press. See her blog posts about being banned from Double Union. There’s loads of other examples in Val’s personal communication with others, some of which has been shared with me. Non-intersectional and trans-exclusionary approach to feminist activism. See Sage’s and others Twitter thread for examples, linked to earlier. Threatening and using her social status to isolate folks who raise concerns about her behavior. I have heard about this pattern from a number of folks and it is perhaps the most troubling aspect of all her problematic behavior. I believe it is the primary reason people have gone so long without talking about these issues and also that it has done the most damage to the targeted individuals. It’s my understanding that Val’s problematic behavior goes back many years, prior even to TAI and to my coming to know her around 2010/2011. I have heard from folks who worked with Val at Sun and have heard rumors about her role in LinuxChix troubles, for example. Informed Decision-making. I want folks to have sufficient background such that they can make an informed decision about working with Val and/or consuming her work product. Harm Reduction and victim support. I want folks who have been subject to Val’s misconduct to know that they aren’t alone, it’s not them, and to have access to a support network. Setting context. I want folks who go to Val for subject-matter expertise regarding diversity & inclusion and governance (code of conduct enforcement) to understand her history with the communities she purportedly serves and the kind of feminist activism she engages in. Ideally this post would also prompt Val to engage in a genuine accountability process regarding her behavior, but I think that is unlikely and it is not one of my motivations or goals. For Val, or anyone associated with these issues for that matter, to be harassed in any way, shape, or form. No dog-piling should occur as a result of this post. I do not wish Val to experience any harm, physical, emotional, or otherwise, for any reason. Note: Discomfort is not the same as harm. For the larger work of the Ada Initiative, Double Union, or any other projects Val has been involved with to be discredited. Many folks have contributed to the work Val has been a part of and I have great respect and appreciation for their contributions. For tech feminists who make genuine attempts at intersectional and trans-inclusionary approaches to be maligned. We should not discount an entire movement due to the misconduct of one person. Feminist leaders that engage in abuses of power and distortions of the truth raise concerns beyond matters of disagreement over tactics. These “ends justify the means” approaches do active harm. I don’t know the best way to stop abusive behavior by feminist leaders such as Val. I may be doing it the “wrong” way and I’m open to feedback about that. But doing nothing or being super circumspect just isn’t an option for me any longer. If there’s anything you’d like to share about your experience working with Val, please get in touch. You can email me ck at christi3k dot net, DM me on Twitter @christi3k, or Signal message me (contact me another way to get this number). I’m happy to update this post to share your experience, or just to be a sounding board if you need someone to listen. The following is the text of the keynote I gave at this year’s grand final for Open Source Bridge on 29 June, 2018. See also Audrey’s post Saying goodbye to Open Source Bridge. 10 years ago planning for the first Open Source Bridge began. 10 years later we are kicking off our 10th and final event, here, together. 10 years is both a very long time and no time at all. Think back to 2008. George W Bush was President. The primaries had concluded but Barack Obama had not yet received his nomination. Most open source projects hosted their code on Sourceforge or Google Code or a self-hosted solution. GitHub was just a few months old and most projects used Subversion anyway. Hardly anyone was talking about codes of conduct or how to fund or sustain our open source work. Both the Open Source Initiative and Mozilla had just turned 10. Microsoft was the sworn enemy of free and open source software. Nodejs was not yet a thing. The term “DevOps” was not yet part of our vernacular. RMS and ESR were the most well-known role models for our movement. 2008 is significant for me personally because it was my first full year in Portland, having moved here the previous Fall. 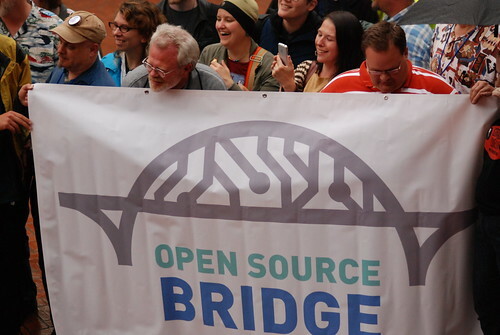 To understand the origins of Open Source Bridge it’s helpful to understand what the Portland tech community looked like in the few years leading up to it. And here I must thank Audrey for the details I am about to share, for she has a good memory and a keen ability to connect and contextualize events with their larger meaning. In 2005 Portland was still recovering from the post-9/11 recession, lagging behind other parts of the country. Community tech was represented by the Linux user group folks and Free Geek, which itself was an outgrowth of a local environmental and community building movement. Corporate tech was represented by the SAO, Software Association of Oregon (now known as the Technology Association of Oregon). There was also a wiki community growing out of the Portland Pattern Wiki lead by the inventor of the wiki, Ward Cunningham. It was during this time that Portland started to establish a reputation as an affordable Silicon Valley satellite. In 2006, when Audrey started attending user group meetings and a year before I moved to Portland, there was no BarCamp Portland. No Legion of Tech, no Calagator, no IgnitePortland, no Open Source Bridge. CubeSpace hadn’t opened yet nor any of the dozens of co-working spaces we have now. What did we have? Monthly meetings of groups like PDXPHP, Portland Ruby Brigade (PDX.rb), Portland Perl Mongers (PDX.pm), often at Free Geek (which started in 2000) or a local pub. There was the cross-technology groups like Portland Web Innovators. You learned about these events by running into someone who knew they existed. Finding groups and events at the time was mostly word of mouth. We had OSCON, an annual open source conference organized by O’Reilly media happening every July at the Oregon Convention Center. Various tech companies called Portland home or had offices here, some still in the process of recovery from the dot.com bust. As OSCON approached, the conference chairs reached out to local contacts about doing some sort of community programming at the event. The previous year, PDX.rb had scheduled a “FOSCON” event one night of the conference, to provide a free way for local user group members to experience some of the Ruby content at the conference. Also, the Portland wiki community had just held an unconference called RecentChangesCamp, and there was interest in having some kind of open space at OSCON as a result. While that discussion continued, PDX.rb members decided to go ahead with a FOSCON 2. It was a packed evening event at Free Geek with free pizza and several Ruby presentations. Meanwhile, the open space at OSCON idea turned into OSCAMP, a free unconference that ran during the day alongside the main event. A large sign on one wall, at the event asked people to contact Raven Zachary if they were interested in working on a Portland BarCamp. Raven had just moved from Austin, and he liked the BarCamps he was involved with there enough to try starting one in his new home. This led to connecting with Dawn Foster, who had also been to the Austin BarCamp and offered to be a co-organizer for one here. Not enough people signed up to help plan in time for the intended date in August, so they decided to build up interest with a series of monthly meetups instead. After an initial meetup at the Ram’s Head, Jive Software offered space to host these meetings, and this event helped form a core of the “Portland tech community” in the late aughts and early 2010s. Each meetup included a round of introductions: people would say their name and what they worked on, and often add details about whether they were new to town or looking for work. Quickly this became a mechanism to help people find jobs, which led to more people spreading the word about this being a great resource for anyone who had just moved here or needed to connect up with local employers. By the following winter, enough momentum had gathered, and several people, including Audrey, stepped up to organize a BarCamp to happen May 2007. CubeSpace, a new coworking space stepped up to offer to host the event. It went well, with roughly 300 people attending throughout the weekend. In June 2007, CubeSpace started offering free meeting space to local user groups, building on the good experience they’d had with BarCamp. Several groups moved in after some discussion, and the space quickly became a go-to resource for members of the open source community looking to hold meetings and events. In the course of producing the first BarCamp, and Ignite Portland that fall, it became clear that there were limits to what an event without a legal or financial entity could do. There was no real way to handle money–we had sponsors pay directly for food and drink since we didn’t have a bank account. Dawn and Raven started talking about what to do to make the next events they ran work better, and along with Dawn’s partner Todd, came up with the idea to start Legion of Tech, a nonprofit. At the end of 2007 the three of them invited several people to become the organization’s founding board: Audrey, Josh Bancroft (who helped set up that first Ignite), Justin Kistner (part of the social media/marketing community), Selena Deckelmann (also heavily involved in user groups, like Audrey), Adam Duvander (one of the PDX Web Innovators founders), and Paul Biggs (who worked with Dawn at Jive). Also in 2007, Rick Turoczy started Silicon Florist, a blog about Portland startups, community events, and other highlights from the local tech scene. This created a central point for discussions about what we were doing or wanted to work on next, something that contributed further to the sense of cohesion in the growing tech community. It was around this time, in Fall of 2007, that I moved to Portland. I went to my first user group the same month I arrived, an early Code ‘n’ Splode hosted at CubeSpace. Here I met Selena and Gabrielle Roth who were running the group. I also met Randal Schwartz who was inexplicably at this meeting for women in tech. I remember this not because I knew who he was at the time but because he gave me a hard time when I said I was a PHP programmer, something which Selena and Gabrielle made a point to tell me after the meeting was not okay and would not happen again. By this time it had became clear to Audrey that the community needed more tools for organizing what was going on. In response to conversations at BarCamp and user group meetings, she set up a PDXGroups wiki and a Google Calendar to track everything that was happening, and enlisted several people who had expressed interest in organizing this information to help out. This worked for a little while, but over the course of the year they started to see the gaps in the plan: getting people to add their group to the wiki was relatively easy, but the calendar required manual authorization of each and every maintainer’s account. Keeping an up-to-date event calendar proved to be time-consuming and unwieldy. As Legion of Tech plugged away at organizing community-wide events in 2008, the range of activities continued to grow. CubeSpace offering free meeting space contributed to a burst of user group activity. Sam Keen started a pair of events called the Winter and Summer Coders’ socials to give user groups a way to connect with each other twice a year. It was all getting pretty intense. In January 2008 Audrey sent out a call to action to do something about the “event calendar problem”, emailing all of the community members she could remember having discussed it with so far. She set up a mailing list. After a couple of weeks of discussion they had our first meeting. Incidentally, still very new to Portland, I joined the mailing list thinking it was the tech calendar, rather than a project to make a calendar. I was very confused by the postings at first. That initial meetup is the day they started working on Calagator. They continued to meet every two weeks from January through July, took a break in August, and came back for semi-regular code sprints until spring 2009, when two things happened: several of us became involved in a new open source conference, Open Source Bridge, that needed its own software, and CubeSpace, our wonderful hosts, went out of business. Unconferences proliferated in Portland throughout 2008. In addition to BarCamp, we had a WordCamp for WordPress users and developers, and a WhereCamp for geography geeks . We were also having a lot of conversations about the side project problem: the tendency for Portlanders to have all of these fabulous technology projects outside their day jobs. Eva and David at CubeSpace suggested a Side Project to Startup Camp for people who might want to turn those side projects into businesses. During this time I started becoming more involved in the community by regularly attending user groups and helping out with Legion of Tech events including BarCamp and Ignite. Not long before that Side Project to Startup Camp was scheduled to happen, OSCON announced it would not be returning to Portland in 2009, cutting a hole in Portland’s connection to the wider open source world. Selena seized on this as an opportunity to do something she’d wanted for a while: Start a new conference that would skip all the parts most developers didn’t care about, and be a fun, grassroots way for people to learn and connect. A conference by us and for us in a way a corp conference could not be. She had a wishlist she thought a community conference could do. Diversity. Ideas that became open source citizenship. At Side Project to Startup, she held a session to discuss the possibilities, and by the end of the day Audrey had signed on to lead it with her. Running a conference turned out to be a lot of work, even compared to the unconferences and other events they’d both been involved with so far. Selena and Audrey quit the Legion of Tech board at the end of 2008 to focus on getting Open Source Bridge off the ground. Audrey spent the first half of 2009 writing, writing, writing. Descriptions of the conference, of the types of content we were looking for, of what we meant when we said it was a conference for open source citizens. “We’re planning a conference that will connect developers across projects, across languages, across backgrounds to learn from each other. We want people to experience something beyond “how to use tool X” or “why databases keel over when you do Y” (even though those topics are important, making up our tools and trade, and will be a central part of the conference content). We’d like to share what open source means to us, what it offers, where we struggle, and why we do this day in and day out, even when we’re not paid for it. Selena reached out to everyone she knew throughout the open source world to get people to attend, submit talks, and sponsor. Igal Koshevoy and Reid Beels, who both worked on Calagator, spent many late nights getting OpenConferenceWare, our proposal and session-planning software, finished up in time for the conference deadlines. Several other community members (Rick Turoczy, Adam Duvander, Kelly Guimont, Jake Kuramoto) joined the planning team to work on sponsorship, marketing, and logistics. I joined the team 6 or so weeks before the conference and took up organizing the volunteers. I also gave two talks that year. Open Source Bridge year one, held at the Oregon Convention Center, was exhausting and fabulous and a success. Looking back over the ten year history of the conference, there were 3 distinct phases. The first includes years 1 through 3 and was really about getting the basics down, establishing infrastructure including a stable business entity and venue host. It was during these years that we figured out how to do all the things that would make us last 10 years. In fact, year 2 of the conference almost didn’t happen. Audrey was burnt out and had stepped away and although Selena stayed involved one more year, it was clear she was ready to pass the torch. We chose a venue that was expensive and unaccustomed to working with a scrappy group of tech folks with little money and comparatively weird ways of doing things. You want to park a housetruck in our courtyard? And the next day you want to add a donut truck? No, you can’t attach WiFI access points to our statues. Oh, and by the way, those 20 cases of Yerba Mate you were gifted can’t come into the venue. With the original Open Source Bridge foundation having been shut down, we used an out of state fiscal sponsor who provided us with banking services but little else. We pulled off the conference but it was a struggle and many folks who helped that year did not return. By this time I felt heavily invested in the community and what we were building. I found our eventual home here at the Eliot Center just days after signing the contract with the art museum and I very much wanted to see what we could do with the conference center in this space, in partnership with First Unitarian. So, I stepped up to chair the conference to ensure there would be a year three. 2010 was a busy year for me not just because of Open Source Bridge. Early that year I joined the board of Legion of Tech, the organization that had been formed to support BarCamp Portland, IgnitePortland, and other activities. In the Fall of 2009 Legion of Tech revealed that one of its board members had been discovered to have embezzled about $30k from the organization. That I chose to join the board after this occured and ended up being the one to lead most of the cleanup shows you just how much love and energy I had for the community then. I still have as much love but oh what I wouldn’t give to have that energy again! The way I have to manage my time and energy now, approaching my 40s is so different from when I was approaching my 30s. While the embezzlement issue was resolved, as much as such a thing can be, by the end of 2010, relations between the community and Legion of Tech were poor. People didn’t trust us, rightly so, and it was hard to fundraise. I felt we couldn’t carry out our mission, and the work that I wanted to do, effectively within the structures and history of that organization. At the same time, the deadline was approaching to open registration and pay deposits for Open Source Bridge and we needed an organization and a bank account in order to do that. So, I approached Audrey and Reid about starting a new organization, the Stumptown Syndicate. The idea was that we would take all the lessons learned from organizing over the last couple of years, and through the missteps of Legion of Tech and do it the right way this time. We’d create a fiscally responsible, long-term home for all these community organizing and events projects we were involved in. Legion of Tech wasn’t defunct yet — but I felt it was likely headed that way and if we did things right the Syndicate would be able to take on its programs if and when that happened. Audrey and Reid were on board and we incorporated the Syndicate in December 2010 which enabled us to pay the deposit for our first year at the Eliot Center and open registration for year three. Thus began the second phase of Open Source Bridge, years 3 through 6, from 2011 to 2014. Looking back these feel like peak years for the conference. We had the Syndicate and were building upon a solid foundations. We really knew how to organize a 4-day multi-track conference. Companies were interested in sponsoring us and did so readily. We saw lots of communities come together and click at our conference. The Geek Feminism, AdaCamp, Wikimedia, Mozilla, and IndieWeb communities. We grew into our new home here at the Eliot Center and into our new partnership with First Unitarian Church. We experimented with different aspects of the conference, removing what didn’t work and a trying new things to find out what did. We improved diversity, inclusion, and accessibility. This is the period where I think Open Source Bridge became known as a queer social justice kind of tech conference. Then and to this day this makes me immensely happy and proud. I’m going to pause here in 2013 for a moment to talk about year 5 a bit. Not only is the 5th an anniversary of most things a significant milestone, but it was also a very bad year for a lot of us. Personally I was dealing with chronic illness and significant elder care and drama. As a team we were faced with the death of an integral team member. Igal died in early April, 10 weeks before Open Source Bridge was scheduled to begin. Contracts had been signed. Tickets had been sold. We had to notify speakers and publish our schedule. We had no choice but to move forward. To make the conference happen. To help settle the affairs of our friend. To navigate our grief. And, most of us had day jobs and families to attend to as well. We managed to keep the conference more or less on schedule. Open Source Bridge year 5 happened. It went as well as it ever had. We had a big party at the Oregon Museum of Science and Industry where we celebrated our 5th anniversary and we celebrated Igal. I’ve tried to figure out exactly how we kept everything moving.I don’t have a clear answer. It appears we just did by doing what we always did — plan the conference. I looked through the archives for our email planning list. The messages don’t look substantially different from any other year. We cancelled exactly one planning meeting, the week of Igal’s death. I think we were able to do this because we had a lot going for us, relatively speaking. It was year five of the event, not year one or even two. We weren’t in a significant transition year in terms of team members. And our core team was and is really dedicated. We also were supported by the Portland tech community at large. While we planned our conference, we also organized a celebration of life for Igal. This is how I learned that it turns out a lot of the skills you use to organize tech events also apply to memorials. As they often did with so many of our events, the Portland tech community came together to help. The folks who we’d been convening with for years at barcamps, user groups, and other events pitched in here and there, in small and big ways to help make Igal’s celebration happen. I mention this in some detail because for me it was a turning point. It made me realize that part of what drives my connection to the community and the work I do for it is my hunger for fellowship. For coming together in the good times as well as the bad times and supporting each other, being with each other, learning from each other. The third and final phase, 2015 to now, was a winding down from this peak. To say we lost momentum is true but doesn’t tell the whole story. By this time things in open source and the tech community, both local and wider, were really different. We had more tech companies with funding trying to higher technologists. We had more and more people moving to Portland. By this time numerous code schools had expanded participation in the tech community. More and more user groups sprung up to meet the needs and interests of these newer, different audiences. Also by this time I think we can say open source had become fully assimilated into business. Adoption was no longer the goal. That had been achieved. We were starting to that access and even ownership of the code is not where the true financial leverage lay but rather in data and services and algorithms. And, by this time GitHub had come to define open source participation. It’s hard to understate the impact this has had on open source. If something is on GitHub in a public repo it’s open source. At the same time that more and more open source participation is happening in walled gardens. Shift away from wikis to google docs. From IRC to Slack. Open source has become a very literal definition and retains very few of the cultural aspects a lot of us were interested in previously. Open source doesn’t mean there is open collaboration. I experienced this very directly in my four years at Mozilla. There were near constant arguments between the different “generations” of open source folks about how to do it the right way. Portland tech continues to grow but there remains a big disconnect between companies and the community. While writing this I found myself wondering, whatever happened to the diversity pledge all those companies signed? It’s my experience that companies are happy to pay for beer and scholarship tickets but won’t fund our work in general except in very small amounts. Not interested in being partners just in colonizing the space. If they sponsor at anything more than a pittance they want too much and they don’t defer to your expertise of what your community needs and wants. We stopped allowing sponsors to throw parties after the year a sponsor threw one that featured excessive drinking after which they and several other speakers were nearly too hungover to give their talks. Most folks organizing the conference couldn’t get explicit support from their employers for doing so, and as such most of the work has been done after hours or covertly during the day. What I’m saying is that not only did it become harder and harder to continue putting in the second shift work the conference needed but it also became harder and harder to fundraise for Open Source Bridge the more and more mature it became. We were never great at fundraising but money was more available in middle period. By the time we got better at asking for money sponsor attention was elsewhere. It’s hard to raise money for a generalist event, particularly one that is no longer shiny and new. It’s even harder to raise money from corporations for one with a social justice bent that always prioritizes the needs of its constituents over sponsors. This fatigue and difficulty fundraising affected all of the events we were doing. The last BarCamp Portland was in 2013. WhereCamp PDX 2015. IgnitePortland 2016. On the positive side of things, in these later years we started to notice new groups building their own things based on same core values that we were trying to express. I think this is a good thing. It is a part of how movements are built and sustained. By 2015 burn out was really starting to set in for me. I was no longer interested in hands-on event planning or running. In part this was due to the amount of crap you have to deal with as an organizer. Harassment from GamerGaters. Being dragged into vindictive lawsuits. Working with the health department when you have a salmonella outbreak at your event. People being mad at you for enforcing your code of conduct. The endless drudgery and paperwork of keeping a non-profit, even a tiny one such as the Syndicate, in operation. I was frustrated at not being able to implement the things we wanted to do with the Syndicate in our spare time while trying to have a life and with a full-time job. I was starting to realize the deep limitations of the non-profit, volunteer model. I stepped down from co-chair role for 2016 conference and new co-chairs, Shawna Scott and Thursday Bram, stepped up and did a great job running the conference. I concluded my second full 3-year Syndicate board term at the end of 2016, leaving several new board members in place to lead things forward. Burn out was not the only reason I stepped away. Simple put, I could no longer do so much work for free. I also wanted to build community and experience fellowship in a way that looked less like my day job. I was wanting more social justice / activist / radical & resilient community building. The AMC conference in Detroit had become a great source of inspiration for me. The projects happening in Detroit that I learned about through the conference are more like what I want to be a part of here. They are decades ahead of where we are in terms of community organizing. This is borne in large part out of necessity and I am not sure the conditions exist yet in Portland for this kind of thing to occur. Much less interested in the politics of free and open source software at least in terms of adoption. Open source “won.” It’s everywhere. It’s become nearly synonymous with tech itself. I’m also at a point in my career where I’m maintaining more than I am building. I’ll spend my evening going to a user group if I need to for work, but no longer for fun or to socialize. I need that time for other things. “Citizenship” as a word and a concept feels increasingly difficult to navigate. Were we starting the conference today perhaps we find a different term for the belonging, membership, and bidirectional rights and responsibilities we envision as integral to participating in open source. Perhaps had we not been mostly (all?) US-born folks with white privilege we would have picked a different term at the beginning. I don’t know. What I do know is that the questions and goals that concern me now are different from the ones of ten years ago. And I suspect the same is true for a lot of you. The stakes feel very different too. What I would like us to do together today during the unconference, before we celebrate this evening, is explore the concerns most pressing to us and to start figuring out what’s next. How do we fund the tech that we need? How do we continue the technology communities we need? How do we connect with the people around us, technical and non-technical? What do we want to be doing in 10 years? What do we need to be doing now to get there? What would it mean for technology to change the world for good? Before I wrap up and hand things over to Kronda, I want to call attention to some things that we have accomplished together over these last 10 years of Open Source Bridge. Yoga! And other mind-body activities such as Geek Choir. We were at the forefront of code of conduct adoption and enforcement. The kinds of conversations we facilitate: cross tech, cross community, cross organization, infrastructure focus, social justice, humane tech. We gave a lot of folks their first keynote opportunity and we paid them. We gave a lot of folks their first speaking opportunity and provided a place for them to speak about things other conferences were not interested in. We built a fiscally responsible, ethical organization, the Stumptown Syndicate. We established and maintain a great relationship with our venue hosts First Unitarian. We brought people together and helped enable them to build things they hadn’t been able to elsewhere. We supported people through life transitions and career development. We helped building connections among people who had common interests and values but hadn’t yet found each other in other spaces. Together we created an amazing body of work that will continue to influence others. We should all be proud of this. Thank you Audrey and Selena for starting this thing that became a huge, defining part of my life for the last decade. Thank you Reid for co-chairing the conference with me for 5 years and for being willing to start the Syndicate with me and Audrey. Thank you Shawna and Thursday for keeping the conference going after I stepped down. Thank you Holli Nicknair and all the Eliot Center staff for being amazing hosts and partners these last 8 years. Thank you to my beloved wife Sherri who not only brought yoga to every year of the conference but also set the standard for grassroots catering and logistics. Thank you Kirsten for running registration year after year with astonishing efficiency and for setting up the Syndicate’s books the right way during your time as Treasurer. Thank you Igal for everything that you did for the community while you were with us and for being my friend. I miss you. We all do. Thank you to everyone who has been a part of Open Source Bridge over the last 10 years. And I do mean everyone. Speakers, volunteers, core team organizers, attendees, those of you who convinced your company to sponsor us. All of you, no matter how small your role may have seemed, it was essential and integral. It’s been an honor and a treasure to have shared this journey with you. I will miss inhabiting this space with you all for a week every June but I’m also excited for what we will do next together. 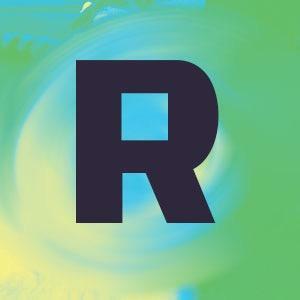 On Saturday, Recompiler Media, which publishes a print and online magazine as well as a podcast (hosted by me) turned two years old. Yay! I’m very proud to be producing a podcast component of the magazine. We’ve shared interviews with amazing, thoughtful technologists such as Meli Lewis, Amelia Abreu, Helga Hansen, Sumana Harihareswara, Thursday Bram, and Heidi Waterhouse. We’ve talked about what happens when your toaster has a DNS bug, we’ve shared all kinds of creepy fun tech news, and we’ve figured out how to hop the internet. I have to start getting this out of my system: I’m vegan. I’m Buddhist. And I’m awfully lonely in my Sangha. I became vegan just over two years ago as a direct result of my starting to study and practice Buddhism. I had been a vegetarian (who made exceptions for sushi and sashimi) a few years prior to that. My reasons for being vegetarian did not have a strong ethical foundation. I stopped eating meat in order to have a healthier diet and to reduce my own environmental impact. Now, you could say that maintaining good health and treating the planet well are ethical actions, and I suppose they are. So what I mean when I say that my vegetarianism did not have an ethical foundation is that I did not take into account the ethical problems of using and killing animals for our own pleasure and convenience. I did not consider it wrong to do these things. I did not recognize the moral personhood of my fellow beings. I now study and practice Buddhism whole-heartedly. It is the foundation of my spiritual and ethical life. The more that I look at the precepts of not killing, not misusing sexuality and not stealing, the more I know from the bottom of my heart that these precepts must guide my interactions with all sentient beings, not just humans. I am a committed vegan. Unfortunately vegans are a rarity in our sangha. Sherri and I are the only two that I know of, though I am sure there are a few others. Now, we (the Sangha) do require that meals be vegetarian at both our Downtown practice center and at our monastery. But we do not require that meals be vegan. And, in fact, some offerings make quite heavy use of butter, eggs and cheese (as a lot of vegetarian, but not vegan food is ought to do). At first the lack of vegan meals bothered me only a little. Mostly it was sad to be left out. Sherri and I are good about bringing vegan meals or preparing vegan treats for special occasions. But we aren’t always told ahead of time that there’s a special occasion and we aren’t always able to prepare food just for us. Last year I recall the time a few surprised our teacher (and the rest of the sangha) with special treats to celebrate the 40th anniversary of him starting Buddhist practice. We didn’t know about the occasion and no one had thought to bring something that was vegan so we couldn’t partake in the sharing of the sweets. The trepidation and estrangement I feel around sangha isn’t so much about not being able to have a cookie when everyone else is. Rather, it’s about the ethical divide that I feel between myself and my spiritual community, especially regarding our relationship to food, all the sentient beings of the world and our interpretation of the precepts. A great deal of our practice together revolves around a set of ethical principles, the precepts, that we are supposed to have in common. We recognize these precepts in nearly everything that we do as a group. We vow together to uphold them. And yet, there are fundamental disagreements about what these precepts mean and how we manifest them via our actions. It is no secret that there is great debate over whether or not Buddhists are required to be vegetarian, let along vegan. Some point to ambiguity in Buddhist scriptures as ethical justification to eat meat/dairy/eggs. (For more on what the Buddha actually taught regarding this issue, I highly recommend checking out Norm Phelps’ The Great Compassion: Buddhism and Animal Rights.) Many famous buddhist teachers, including the Dalai Lama, continue to eat meat, further confusing the issue. Personally, I think that when one really examines the heart of the precepts and relinquishes their own attachments to the habits and convenience of consuming animal products, it’s very clear that to practice Buddhism one should really adhere to veganism. However, I’m willing to accept that not all Buddhists will come to the same conclusion that I do on this matter, even if I don’t like that fact. What I take issue with is that as a community we have made a choice that is not the most compassionate one we can make. We aren’t setting the best example that we could. We have a tremendous opportunity to provide a container of shared practice that is most compassionate and we don’t. Out of habit. Or ignorance. Or something; I’m not sure of the reasons. When this topic comes up in my practice circles, abstention from animal products is often compared to abstention from alchohol. I think this comparison is raised to indicate that while there is some prohibition against causing harm to sentient beings (as is required in the consumption of animal products) and misusing alchohol, that ultimately it’s up to the individual practitioner to determine his level of abstention from each activity. I take great issue with this comparison. First, I do not think that occasional and moderated use of intoxicants (a definition to which many, many things can apply) is akin to the killing and/or causing suffering to an animal merely for the sake of convenience and desire. However, the validity of this comparison is immaterial to the discussion at hand. My point in mentioning the alcohol-vegan comparison is that my Sangha has a very clear policy that no alcohol be served at community functions. I’ve never asked why this policy is in place (though I think I will now). But, I imagine that it is in place to support those who are in recovery, and to support those who take the precepts to mean that one should refrain from alcohol and other intoxicants. In any case, it’s clear that the use of alcohol is morally questionable and so we do not allow it at community events or in our residential training center. Why, then, do we not follow the same logic with our meal choices? I can only fathom that we have yet to overcome the inertia of habit, and of living in a society that is not vegan. This saddens me greatly and it’s becoming more and more difficult to share a meal whole-heartedly with my community. Sherri and I try to attend the public serve at Great Vow whenever possible. We enjoy practicing at the monastery and sharing a meal with our community afterwards. However, I’m starting to dread these meals. During my most recent meal at the monastery a wave of pain and grief hit me while we were performing the meal chant. Chant cards had been handed out and as we were about to start, I looked down to see that a small bowl of food had been set aside and labeled ‘Vegan Daal.’ I immediately thought to myself, “there’s no reason, other than lack of foresight and effort, that a vegetarian daal can’t be made vegan.” Rather than feeling happy that Sherri and I had been accommodated, I felt deeply unsettled. Tears came to my eyes. After the chant I excused myself for a while and sat in the car by myself until I could regain some composure. I felt that by being there I was saying it was okay that everyone else was eating milk and butter. But it’s not okay. Milk and butter are products stolen from a cow, a mother, for which she did not give her consent and for which she undoubtedly suffered. I felt complicity to this suffering. It’s hard for me to feel cameraderie or good will in my community under these circumstances. How can a community that is supposed to share the same values as me, or at least very similar ones, disagree on something so fundamental? I will pause here to say that I do have compassion for my fellow non-vegan practitioners. I know that change takes time and that making the switch from omnivore or vegetarian is challenging for some. I don’t think that non-vegans are intrinsically bad people. Veganism, for me, is not about us, or you or me. It’s about the animals who suffer because the world isn’t vegan. I have tried to direct my energy around veganism and the precepts into positive, non-judgmental education and outreach. For the most part I think I have done a good job, and will continue to engage in vegan-related advocacy projects and conversation. But I don’t know what to do with the pain that I feel around shared Sangha meals. They are now triggering to me in a way that I find nearly debilitating. I shouldn’t have to endure panic attacks in order to partake in the community hearth. I’m not sure what to do. Do I take a break from Sangha activities? Do I request that all meals be vegan? What do I do if the answer is ‘no’? Do I seek out another sangha, one that is vegan? Are there any vegan buddhists out there who have worked through a similar situation with their own Sangha? What did you do? We regard it as essential to keep the mind free from excesses such as greed. We regard this food as good medicine to sustain our life. For the sake of enlightenment we now receive this food. 2010 started busy and shows no signs of becoming less buy any time soon. I’m now nearly five months into my new job at FINE Design Group. I’ve launch one project for Blackstone Winery and will launch another one shortly. In addition to my programming work at FINE, I’ve also been able to flex my system administration skills, which I has been nice. I’m also about to wrap up my contracting gig, which will be a big relief. It’s been very difficult working these two jobs simultaneously while trying to keep up with my volunteer commitments. This year I’m serving on the planning team for the second Open Source Bridge conference, happening here in Portland during the first week of June. This year I am serving as Project Manager and Volunteer Coordinator. The conference went really well last year and I’m very much looking forward to this year’s event. We just opened the Call for Proposals (so get yours in!) and are about to finalize our venue. I’m happy to announce that I am now a Legion of Tech Board member! For those who don’t know, Legion of Tech produces free events for the Portland tech community, including BarCamp Portland and IgnitePortland. Part of my duties as board member is to help plan this year’s BarCamp, which will be co-located at the University of Portland with CodeCamp. Very exciting stuff! Last, but certainly not least, I’ve continued my role on the Communications Committee with the Zen Community of Oregon. We’re working on a new website (design and custom content management system), and really stepping up advertising efforts for our Portland Program. Sherri and I have started working on the garden for this year. So far we’ve managed to completely clear the blackberries (again) and have one of the raised beds prepared. In fact, last week Sherri started sowing peas at either end of the bed. But this is just a start. We plan to use all four raised beds this year, the entire area around our deck and also to expand last year’s winter squash patch. With luck, we’ll send our un-used hot tub off with a friend and use that space entirely for greens. I also have tentative plans to build a new compost structure. In December, I bought a friend’s 1972 Toyota Corona Mark II. This is definitely a project car. Like any vehicle nearly 40 years old, it needs a lot of work. I’ve wanted to learn more about working with cars for a long time. So, I’m as excited as I am daunted by this particular project. I know I don’t need to do it all myself, however. I think I’ll be working on this a lot more when the weather warms up. 1972 Toyota Corona Mark II. Yes, the car is older than I am. I’m not sure where I got the idea, but around Christmas time I started folding paper cranes with the idea to make 1,000 of them. I’m at 62 (hey, I’m 6.2% done). I’ve also been learning how to make some geometric origami structures. I’ll be adding items to my Origami Set on Flickr as I complete them. Crane #50 out of 1,000. One of the ways to start sanzen (private interview with the teacher) is to state what your zazen practice is. There are several techniques one can employ during zazen. Your teacher will often suggest a particular technique based on what she knows about you and the state of your Zen practice. Some of the most common zazen methods are: opening awareness to sound, performing body scans, doing metta (loving-kindness), and following the breath in the body. My practice is the latter-most technique: I follow my breath in my body. When I sit down to meditate, I first work to find a comfortable position. Usually I sit on a zafu (round cushion) in Burmese style: legs crossed in front of me, but both flat on the floor. At times I will also sit in half-lotus position, but I find that harder to do for longer periods of time. I check that my posture is upright, but not stiff. I make sure I can breathe freely, that my stomach is unencumbered and can move easily as my diaphragm expands and contracts with each breath. Then start to breath deeply and deliberately. I try to maintain my attention with my breath as it moves through my body. I notice how my ribs expand as I breathe in, starting with the top most ribs and extending towards the bottom-most ones. I notice how my stomach expands and moves outward. I notice how my arms move outward ever so slightly. And then I do the same in reverse as I follow the breath as it leaves my body. I note, without judgment, any tight spots in the path of my breath. Sometimes I find that my breath is shallow and difficult as if I simply can’t get oxygen to the bottom of my lungs. Sometimes my chest grows heavy and starts to burn. Other times I feel like the air itself: light, almost as if I could float right off the the zafu. While I’m doing this I try to think of nothing else but the sensations of the present. If I notice my mind wander, I try to simply notice this wandering and once again return my attention back to the sensations of breath in my body. I do this over and over again and without judgment. Okay, sometimes I have judgment about how well or poorly I’m doing zazen. But then I notice this too and return my focus to my breath. My ability to concentrate in this manner varies. At times my mind wanders incessantly and I will be lucky if I am able to count three breaths before I start revising my todo lists, having practice conversations in my head, or working out a programming problem. Or sometimes I realize the monkey-mind has been running wild for who-knows-how-many minutes and I’ve not even been aware of it. But every now and then I will have several moments of sustained concentration, of simply being present to my life. It sounds so easy, yet anyone who has tried it knows how truly difficult it is to just sit with yourself and breathe. It sounds so simple, and yet the depths of this technique I feel I’m only beginning to experience. I’m in the middle of reading Zadie Smith’s On Beauty. The novel centers around the Belsey family, Zora of which is the eldest, followed by Jerome and then Levi. The latter bit of narration nearly brought me to tears because it so elegantly captures how I feel about my own three brothers. People talk about the happy quiet that can exist between two lovers, but this too was great; sitting between his sister and his brother saying nothing, eating. Before the world existed, before it was populated, and before there were wars and jobs and colleges and movies and clothes and opinions and foreign travel — before all of these things there had been only one person, Zora, and only one place: a tent in the living room made from chairs and bed-sheets. After a few years, Levi arrived; space was made from him; it was as if he had always been. Looking at them both now, Jerome found himself in their finger joints and neat conch ears, in their long legs and wild curls. He heard himself in their partial lisps caused by puffy tongues vibrating against slightly noticeable buckteeth. He did not consider if or how or why he loved them. They were just love: they were the first evidence he ever had of love, and they would be that last confirmation of love when everything else fell away.